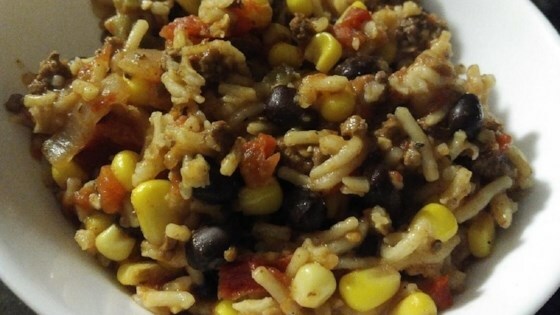 "This is a mild one-pot chili featuring Knorr® Spanish Rice. It brings all the comfort of your standard bowl of chili, but with a wonderful mildly seasoned and sweet taste that is sure to be a hit with family and friends, both young and old! Garnish with your favorite toppings; I chose shredded cheese, cilantro, onion, black olives, and a dab of sour cream. This would be great served with corn bread and a side salad." Combine ground turkey, red onion, green bell pepper, and garlic in a Dutch oven. Cook and stir until turkey is browned, 8 to 10 minutes. Drain excess grease. Stir diced tomatoes, black beans, and corn niblets into the Dutch oven. Bring to a boil. Reduce heat and stir in water and Spanish rice mix. Simmer until rice is fluffy and tender, about 7 minutes. Let stand before serving, about 2 minutes. For a spicier chili, replace green bell pepper with a hotter pepper or use diced tomatoes with green chiles instead of the fire-roasted tomatoes.